don't make lemonade, make Limoncello! is super easy to make (I've always wanted to say "super-easy") The trickiest bit is making sure you avoid the pith when you peel your lemons. uses lots-o-lemons (well, the peel of said lemons). is a refreshing tipple, or digestivo if you speaka da lingo This coming from someone who "does not have a natural apptitude for languages" And I'm quoting from my Year 8 Italian report here - this was written next to a big, fat D.
You need four things to make Limoncello: lemons, 100 proof vodka, sugar, and water. Oh and patience. 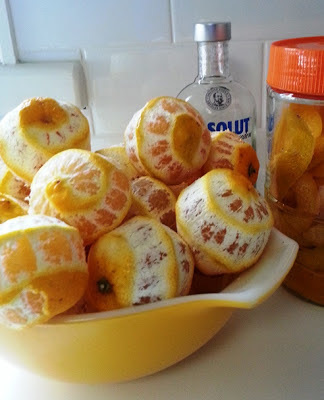 You'll need lots of that, because it takes a couple of months to get molto delizioso limoncello - a month for the lemons to give up their lovely lemon-ness to the vodka, and another month in the bottle once you add the sugar syrup. The longer you leave it, the smoother the flavour, and you want smooth limoncello. All I need to do now is add a simple sugar syrup. Yes I know it looks like wee*, but in a month, after filtering, it will look cloudy like the real thing. Anth and I had a sneaky little taste test last night and even though this stuff is fresh, "Oh Mio Dio! ", it tasted good. 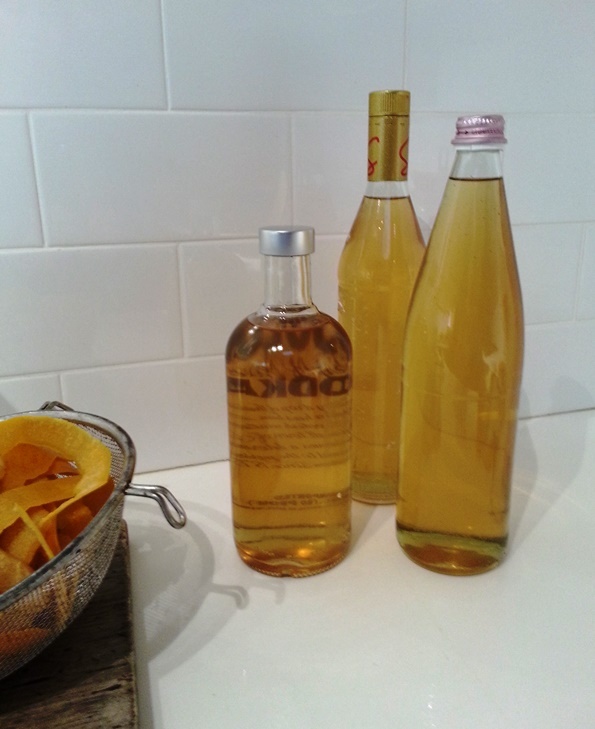 A bottle of homemade limoncello would make the perfect Summer Christmas present. Just remember, a tiny glass, sipped s-l-o-w-l-y. Take my advice here okay - I speak from experience. *but it definitely doesn't taste like it! p.s. Limoncello Pound Cake sounds nice. p.p.s. gonna give it a whirl libarygirl? I almost forgot to mention this awesome give-away over at Rebecca's. You've got until the 8th of July to enter, so what are you waiting for? Very cool! I studied herbal medicine for awhile -- not that you are talking herbal medicine, LOL -- and I love to see recipes for anything that pulls the properties from plants into something else! so, i wonder, does it go cloudy too, as it sits and waits? i love me a glass of limoncello, mhmmm! That sounds so incredibly good...but I don't have the patience to wait two hours for something, much less two months! 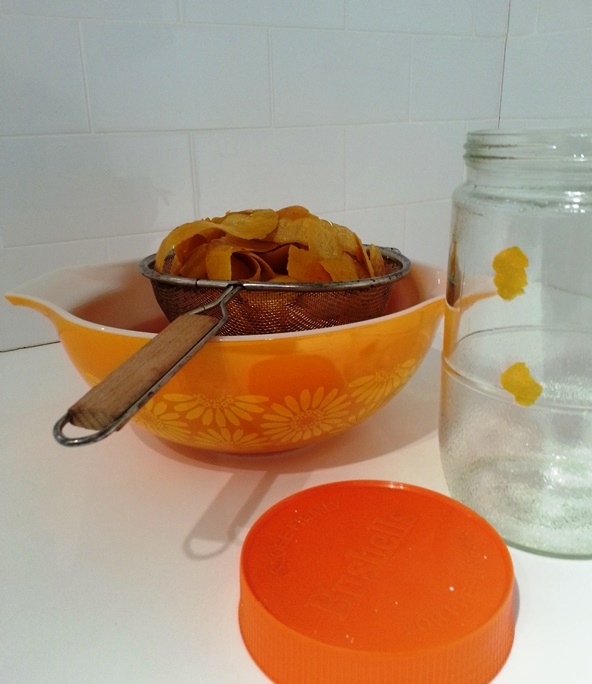 Yum ... Totes digging the pyrex too! oh yes, once I've drunk my holiday bottle! 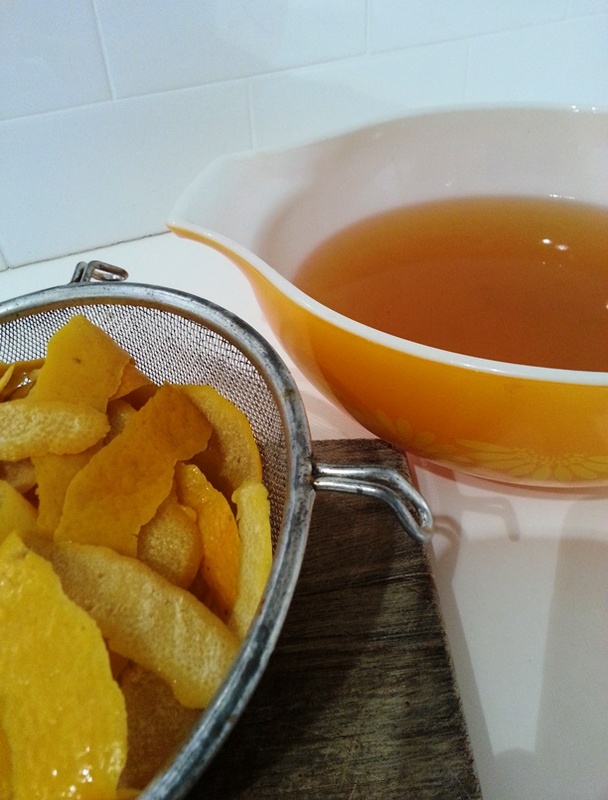 I've done a limoncello link up to you from my blog today, Kylie. And you're right, a teeny glass icy cold is the way to go! Geez you're funny. I start reading every one of your posts thinking 'this chick can't make me laugh anymore because she's said all there is funny to say'. And there you go again, making me laugh. Just stop it. Lemony goodness for sure -- If your wee was that colour, I would suggest drinking more water, less vodka..hehe. My mom made bottles and bottles of this one year. She was inspired after a family trip to Italy which is worthy of its own blog post someday. Lemoncello is a real treat. I know it is winter in your world, but it is the perfect sip for a summer's evening... And, thanks so much for the mention of the give-away. Shipping to a winner in Australia would be my pleasure! Going to get mr ouch to have a go! brilliant! you had me at limoncello pound cake!!!!! !